Norman P. Grubb - English born and sent of God into the heart of Africa as a young missionary, Norman Grubb became a blazing torch and soldier of faith as he gave his life to the preaching of the gospel. After the death of his father-in-law, C.T. Studd, he founded the World Wide Evangelization Crusade. His deep passion for understanding the deep things of God drove him to pioneer, teach and author what some say is the 20th century reformation. He delves into the Apostle Paul’s mystery of the gospel, which is revealed in Romans 6 through 8. Norman Grubb is God’s chosen instrument to proclaim not only “Christ in you, the hope of Glory,” but also Norman clarifies the hidden truth asked by the writer of the book of Hebrews, “What is Man?” This tremendous truth concerning the human is the key to our liberation. 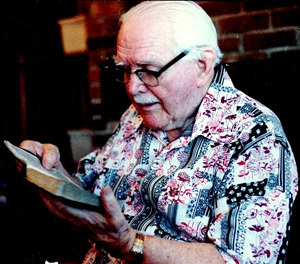 No one after reading Norman Grubb could say that they have not heard from God. His writings are very deep, but exceptionally liberating and full of new light. If you have not read Norman Grubb, you have not heard the total truth concerning your regeneration in Christ, and the truths concerning yourself as a wonderfully free human being. We are what we are at our center, and our nature is the nature of the one who lives in us at the center. A temporary deviation does not alter that basic nature, but is just a diversion. When at the new birth Christ becomes our fixed center, we have begun to express His divine nature, though we may and so deviate into the flesh: but that does not alter the center. So just as a slave of the devil can do a few good things occasionally return to whom he belong, a slave of Christ can do a few bad things and return to whom he belongs. Do not mistake a deviation for a nature. We can never have two natures at once. Impossible. We are always pure at the center, in the sense of the word meaning unmixed. We were unmixed in our heart allegiance to Satan; thank God we are not unmixed in our allegiance to Christ. You cannot have a double mind or a double tongue (as James said of a fountain not being able to ‘send forth at the same place sweet water and bitter’). We have a single mind or tongue, but it can be temporarily diverted. Call that double, if you like, but basically it is single. You must use scroll bar to read entire book! A Bit on Faith in Action"Union Life"
The Fixed Fact of Christ - From "The Four Pillars of WEC"